Some two decades before Sam Raimi tortured Bruce Campbell in the woods over the Necromonican, a group of college kids lensed an ambitious home movie project about two couples who go on vacation only to be beset by various supernatural and demonic creatures. Oh yeah, and the beasties were seeking an ancient satanic book that our intrepid heroes just happened to come into possession of. Originally titled 'Equinox - A Journey into the Supernatural' and running just over an hour, this film was an obvious labor of love for the small cast and crew. If seen as intended (a college film project) then it is quaintly enjoyable. Yes, the acting is pure amatuer night (with the exception of a pre-WKRP Frank Bonner who turns in something of a semi pro perf) and the script cannot match the ambitious plot, but the film does have a ringer that immortalized it in the minds of it's fans. That is it's fairly amazing special effects work by a pair of major players in the genre, Jim Danforth and David Allen. Both of these men were noted stop motion animators who have previously worked in film (Jack the Giant Killer, When Dinosaurs Ruled the Earth) and on T.V. (The Outer Limits). 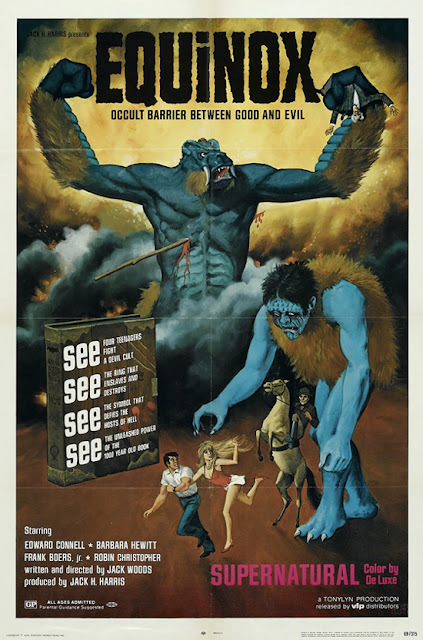 Said created effects creatures include a tentacled monster that is (unfortunately) only partially glimpsed, a huge ape-like monster, a giant prehistoric man (achieved through using a live actor and some extremely clever forced percpective photography) and a winged demon. All of these were crude, yet remarkable creations that were admittedly far more ambitious than the project deserved. The film lay unreleased for three years before low budget entrepeneur, Jack H. Harris commissioned Jack Woods to direct additional footage after re-gathering the original cast (who after all that time, looked noticeably older) and re-arranged some footage so as to introduce a new character, Asmodius the satanic forest ranger (played by Woods). Deciding that the film would be more marketable if it were more exploitive, Asmodius rapes and possesses Hewitt's character who in turn attempts to do the same to Christopher (making for a mild lesbian encounter of sorts). Whether this new footage actually adds to or subtracts from the proceedings is up for debate. Fortunately, Criterion discovered the long lost original cut and incredibly released it as a deluxe double disc (complete with enough supplements to make the original filmmakers blush) so now you can make the comparison in the comfort of your own home. Harris incidentally, would go on to do a similar job when he got hold of John Carpenter's college project, 'Dark Star'.